Bolivian President Evo Morales has suffered a broken nose after being fouled by a goalkeeper during an indoor football match. The president's team was playing a local side, the Independence Warriors, in the rural region of Cochabamba. Mr Morales was treated at a local clinic and order to rest for two days, his office said. 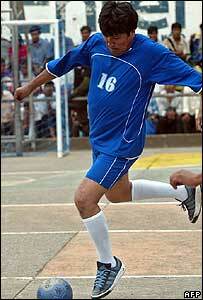 President Morales is said to be passionate about football and often plays at the weekend. "In the game's 32nd minute, with the score tied 2-2, the local team's goalkeeper committed a foul against the President of the Republic that produced the injury to his nose," a statement from the president's office said. After a brief and routine operation, the president was advised to rest. The injury means he might not be able to take part in a match next Sunday between government representatives and special guests invited to the inauguration of the Constituent Assembly, who are expected to include Brazilian President Lula and Venezuelan President Hugo Chavez. President Morales was sworn in as Bolivia's first indigenous president in January this year.